Have you ever looked around campus at the beautiful flowers blooming and wonder who takes care of them? The ICC Grounds Maintenance staff consists of approximately 5-year-round and 11 seasonal dedicated workers who are responsible for maintaining the landscape on all our campuses. Students and Faculty alike deserve an environment they can be proud of and that’s why our Grounds team works diligently every spring to maintain over 1000 plants ranging from roses to ornamental grass. Grounds Maintenance has implemented a new Zone Maintenance Program. We have been focusing on new opportunities to enhance the campus through dividing the campuses into more manageable work areas. The department goal is to provide attractively designed campus grounds that are well-maintained, create a positive impression, and establish a peaceful environment for the use of the students, faculty, staff, and visitors. In addition, our goal is to incorporate sustainable landscape designs and plants to promote green practices and lower our carbon footprint. We will strive to enhance the academic environment through the beautification of our grounds and establish the campus as a source of pride within the community. Grounds Maintenance has helped with the sustainability of ICC by implementing a green roof on top of the CougarPlex and by making their own compost to fertilize all those beautiful plants! We have also installed rain sensors that shut off the sprinklers during precipitation to help reduce water waste. Finally, we maintain the baseball, softball, and soccer fields. We work tirelessly to shovel sidewalks and parking lots — working to keep up with the snowfall to make our campuses safer for all of us. If it’s outside then Grounds Maintenance is there to take care of it. So take time to “stop and smell the roses” and appreciate all their hard work maintaining 176 acres! 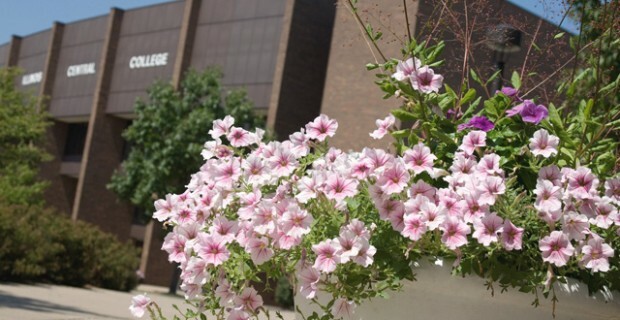 To request landscaping services or grounds maintenance or in case of an emergency, please go to Maintenance Connection or contact the Facilities Services Department at 694-5120.